The Kia Forte incorporates several active and passive safety measures that work hard, so you can enjoy the journey ahead. The chassis itself is reinforced to maximize strength and durability, and crumple zones and side-impact door beams are built in to deflect impact in case a collision. Inside the cabin, six airbags and sensors are placed strategically to cushion passengers from every angle. Additionally, the three-point seat belts are height-adjustable to create a comfortable fit for everyone. And for the little ones, the Kia Forte includes the LATCH system for child safety seats and child-safety rear door locks. Blind Spot Collision Warning alerts you when another car drifts into a blind spot, so you can change lanes safely. 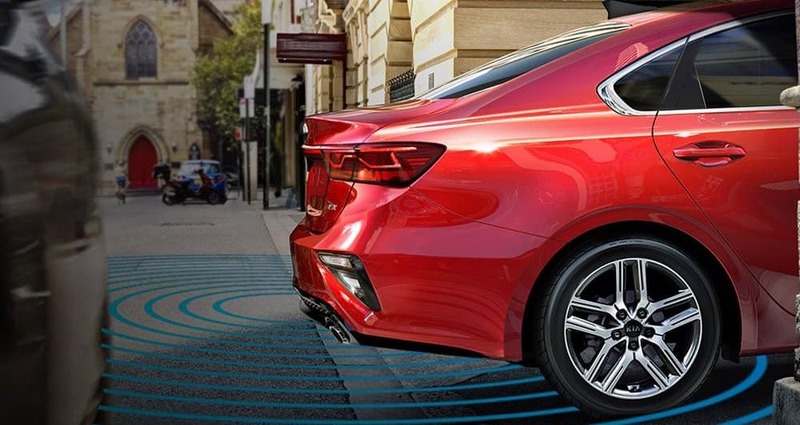 Forward Collision Warning measures the distance between your vehicle and surrounding traffic, stopping immediately if you get too close to the car ahead. Lane Keeping Assist-Line prevents unintentional lane drift by steering your car back to safety if it begins to cross the lane marker. Rear Cross Traffic Collision Warning watches for obstacles behind the vehicle in reverse and alerts you if something is detected. Smart Cruise Control maintains your desired speed, but also slows and even stops to match surrounding traffic. You’ve heard the Kia Forte specs, now experience the Forte in person at Jeffrey Kia! Want to get behind the wheel of the Kia Forte LX? Visit our dealership, near St. Clair Shores and Sterling Heights, or contact us with your questions.